Thank you for ordering Isotonix Supplements. 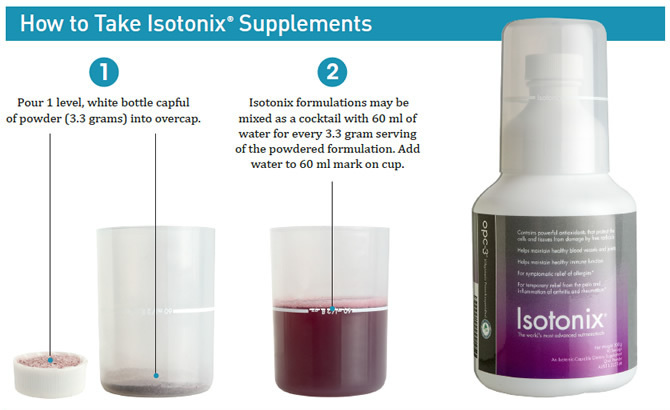 Attachment: How to Take Isotonix Suppments. Use this version in your email. Thank you for your purchase of one or more Isotonix products. Note that you earned 2% cash back on your order. If you checked out as a guest, please go ahead and fully register using the same email address that you checked out with, to access these funds for future orders. My name is Jonathan Glassman, and I've been assigned as your personal shop consultant. I'm here to answer any questions that you may have about Isotonix or any of our other products and to ensure you get the most benefit from the products that you ordered. For fastest absorption, Isotonix is best taken on an empty stomach. Most vitamins need to have food in the stomach to help buffer and facilitate digestion; but because Isotonix nutrients are isotonic (the same fluid pressure as your body fluids) they do not need to be digested. In fact, 90-95% is bio-available within 15 minutes. If you need to eat sooner than 15 minutes you will still get the benefits of your Isotonix nutrients however the absorption may be slightly decreased or may take longer. While most Isotonix products are designed to be taken on an empty stomach first thing in the morning the Isotonix Digestive Enzymes with Probiotics should be taken with, or immediately following, a meal. It is recommended that you split your Isotonix Calcium Plus servings with one in the morning and the other at night. Simply pour the contents of the packet into a glass, add 8 oz (240 ml) of water, and stir. The contents may fizz during mixing. Drink slowly when the fizzing stops. 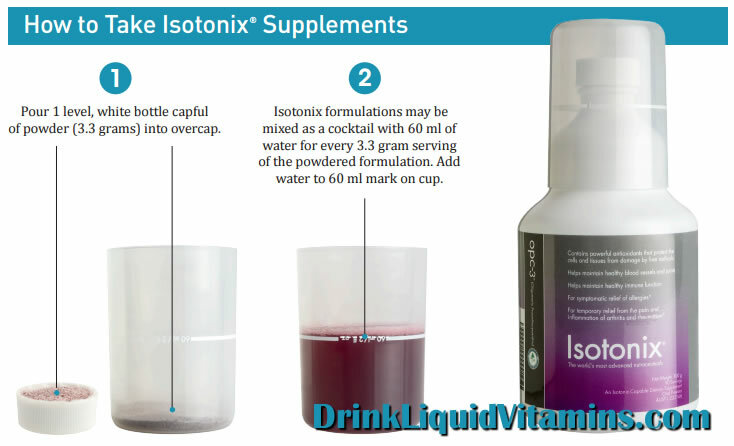 First, remove the small white screw cap from your Isotonix nutrient bottle. DO NOT REMOVE THE FOIL covering the bottle’s opening. Second, MAKE A SMALL HOLE IN THE FOIL as this will make measuring more accurate and keep moisture out. Use the small white screw cap from the bottle to measure each portion of the powdered nutrient. Use the clear over-cap/cup to measure the water; the line around the middle of the cup is the 2 oz. line. Each capful of powdered nutrient requires 2 oz. of water. If you are taking more than one capful of a nutrient or multiple nutrients at once, mix the powder and water in a larger glass. Isotonix nutrients mix best in room-temperature water. Stir until completely mixed. The contents will fizz during mixing. When fizzing stops, drink slowly. Wait 15 to 20 minutes after drinking your Isotonix nutrients before consuming your morning coffee or meal. You may notice a small cluster of un-dissolved particles at the bottom of the glass. We recommend swirling the remaining particles and consuming as much as possible as some ingredients will not dissolve as well as others. All Isotonix nutrients should be used within six months of being opened. Keep in cool dry place & out of sun, away from moisture. Do not put the large over-cap back on top of the bottle after you have used it with water as this may expose your product to moisture. We offer a wide assortment of amazing products. Please refer to our brands page at https://www.shop.com/CHAKRA/info/our-brands to learn more.